Satapatri or Rose aroma is known to have an immediate calming effect on depression, anxiety and mental exhaustion. Rose is amongst the most expensive fragrances in the world as it yields one ounce from a quarter million fresh rose flowers. These incense sticks are infused with this essential oil. 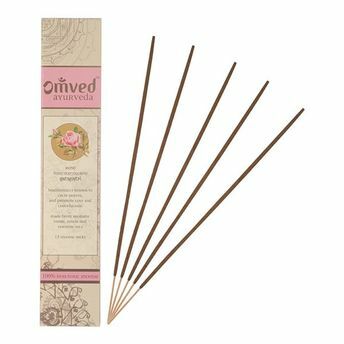 Omved's Ayurvedic incense are made in the traditional way with a 'masala' or mixture of 100% natural aromatic botanicals (no charcoal) are rolled into natural bamboo sticks as compared to 'dip incense' in which sticks of charcoal are dipped into synthetic fragrance or essential oils. These aromatic ingredients combine to produce a smooth, slow-burning incense. The result is a fresh and fragrant breath of conscious bliss.